• For quantitative determination of oxalate (oxalic acid) in urine and other samples. • Sensitive and accurate. Use as little as 10 µL samples. Linear detection range in 96-well plate for 10 minute incubation: 20 to 1500 µM oxalate. • Fast and convenient. Sample pre-treatment is faster and easier than using activated carbon in competitor’s assay kits. • High-throughput adaptable. The procedure involves addition of a single working reagent and incubation for 10 min at room temperature. Can be automated for processing thousands of samples per day. • urine, animal and plant tissue samples. • Oxalate or Oxalic Acid is a metabolic breakdown product of the Kreb's Cycle in eukaryotes, and the glyoxylate cycle in other microorganisms. It can be found in the urine of humans and other mammals. Oxalate concentration can be used as a measure of kidney function where a high level of oxalate is an indicator for kidney stones which are primarily made of the insoluble salt calcium oxalate. 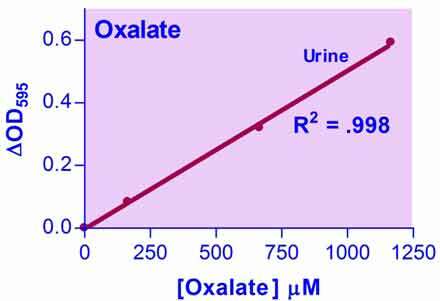 Measuring oxalate is more accurate than measuring calcium as a marker for kidney stones because calcium is excreted at high concentrations even in normal urine. Simple and high-throughput assays for measuring oxalate concentration find wide applications. BioAssay Systems' oxalate assay kit uses a single Working Reagent that combines the oxalate oxidase reaction and color reaction in one step. The change in color intensity of the reaction product at 595 nm is directly proportional to oxalate in the sample. This kit is shipped on ice. Upon receiving, please keep the kit in the freezer (-20 to -10°C). The assay kit has been tested with human serum, rat serum, human plasma, plant tissue samples, and human urine. Please follow the directions on the protocol for sample pretreatment. 3. How do I prepare cell or tissue samples for assays? Follow the general protocol below for cell and tissue samples. Cell Samples. Suspend about two million (2 × 106) harvested cells in 400 µL PBS on ice. Lysis can be achieved by homogenization (10-20 passes in a Dounce homogenizer on ice) or by sonication (preferably performed in a ice-water bath). The degree of cell lysis can be checked under a microscope. Centrifuge homogenate at 14,000 g for 10 min. Transfer the clear supernatant into a clean tube. It is prudent to run a pilot test of the sample at different dilutions. Choose a dilution with the readings in the linear range of the standard curve for further assays. Most samples can be stored at -80°C if not assayed immediately. Tissue Samples. Cut the tissue into small pieces and weigh 20-100 mg tissue, then add 200- 1000 µL ice-cold PBS. Lysis can be achieved by homogenization (10-20 passes in a Dounce homogenizer on ice) or by sonication (preferably performed in an ice water bath). The degree of tissue lysis can be checked under a microscope. Centrifuge homogenate at 14,000g for 10 min. Transfer the clear supernatant into a clean tube. It is prudent to run a pilot test of the sample at different dilutions. Choose a dilution with the readings in the detection range of the standard curve for further assays. Most samples can be stored at -80°C if not assayed immediately. 4. What is the benefit of using an internal standard? Some assays encounter interference and the values cannot be compared to a standard curve. The use of an internal standard corrects for potential interference. 5. I don’t have the correct wavelength filter, what other wavelength(s) would work? The assay can be measured at 550 - 600 nm with 595 nm as the peak. Reading outside this range will result in a significant decrease in sensitivity. 6. Can I store unused reagents for future use? Yes, unused reagents can be stored according to the assay protocol. Repeated freeze/thaw cycles of reagents should be avoided. Working Reagents should be made fresh for each assay and used within 2 hours. 7. Do I need to use a standard or standard curve with each assay run?